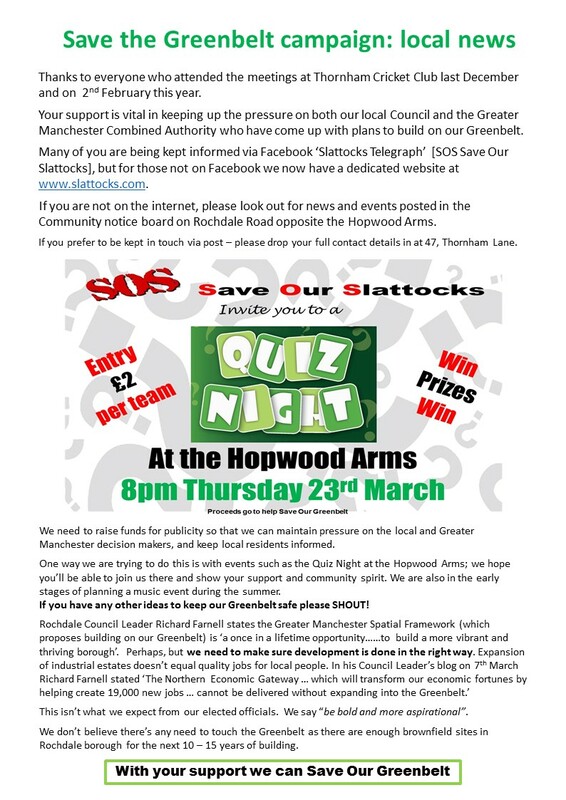 Yes, following the Quiz Night @ The Hopwood which raised over £200, we thought we should put our hands in our pockets, like other local groups have, and help make the Albert square Rally on 1st April a total success. So we’ve agreed to pay around £70 to the hire of the generator to power the public address [PA] – so everyone can hear from the invited speakers. None of this could happen without your continued support so a big big thanks to all our supporters. 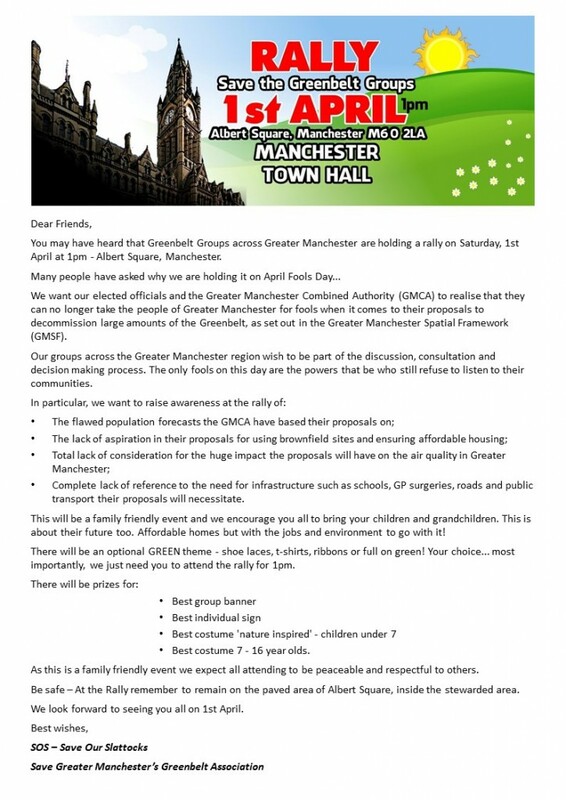 We want our elected officials and the Greater Manchester Combined Authority (GMCA) to realise that they can no longer take the people of Greater Manchester for fools when it comes to their proposals to decommission large amounts of the Greenbelt, as set out in the Greater Manchester Spatial Framework. Our groups across the Greater Manchester region wish to be part of the discussion, consultation and decision making process. The only fools on this day are the powers that be who still refuse to listen to their communities. – Complete lack of reference to the need for infrastructure such as schools, GP surgeries, roads and public transport their proposals will necessitate. This will be a family friendly event and we encourage you all to bring your children and grandchildren. This is about their future too. Affordable homes but with the jobs and environment to go with it! There’s a GREEN theme – shoe laces, t-shirts, ribbons or full on green! Your choice… most importantly, we just need you to attend the rally for 1pm. – Best costume 7 – 16 year olds. The hashtags can be used on both facebook and twitter and we would love people to get using them whether posting, sharing, quoting or retweeting, this will help us to trend and really get us noticed. Well, we’re not against development for the sake of it, let’s be clear about that from the start. We agree that people need places to live in. What we believe is that development needs to be appropriate. By that we’re saying that in Rochdale Borough there are so called brownfield sites that desperately need redeveloping before the Council considers using Greenbelt land and greenspaces – the lungs of the area. Rochdale’s town centre is an example of where planners should be looking harder for solutions. Whilst it has a new bus & Metrolink interchange and plans for a retail/leisure development on the site of the former Council offices [Black Box] and bus station, not far away it’s a different picture altogether. Many of the shops along the Esplanade and on Drake Street are empty and look abandoned. Along with these is the old Odeon cinema/Focus DIY site at the junction of Oldham Road which has laid bare for some time. If the Council had true vision and was bold, it would look seriously to reinvigorate these areas with much needed affordable housing. This would then be, as has been suggested elsewhere, close to transport links so that residents can easily get to the jobs the Council says it will help create. We’ve used Rochdale town centre as an example, but are sure that much the same can be said of Middleton, Heywood and the village centres throughout the Borough. Join your local Save The Greenbelt campaign because ‘we have a once in a generation” chance to do the right thing, as Council Leader Richard Farnell has said. Tell the planners to redevelop brownfield sites before they even think about covering the Greenbelt with concrete. But at the same time, tell them you expect them create the infrastructure to go with these developments: hospitals; GP centres; and schools amongst others, otherwise things will only get worst. Let’s make the whole of Rochdale Borough a place to be truly proud of and with a thriving, vibrant future. Check out the fantastic SOS Save Our Greenbelt music video here!